THERE ARE ALWAYS SO MANY THINGS TO DO IN TORONTO. GET OUT AND ENJOY SOME OF THE MANY GREAT PERFORMANCES AND EVENTS TAKING PLACE THROUGHOUT THE CITY IN JANUARY! JANUARY 1 A New Year’s Day tradition for more than two decades, Salute to Vienna brings waltzes and operettas to the Roy Thomson Hall stage. JANUARY 2 & 3 The city’s AHL team, the Toronto Marlies, return for the new year with back-to-back weekend games against the Syracuse Crunch at Ricoh Coliseum. JANUARY 6 TO 17 Take in the best of Canada’s indie theatre scene during the Next Stage Theatre Festival, which showcases a roster of talented writers, directors and actors in a diverse lineup of plays. Among this year’s offerings are Rachel Blair’s acclaimed A Man Walks into a Bar, a smart social commentary on gender and power, while Take Your Mark Productions’ improv-driven Stuck has players performing a one-act play based on audience suggestions. JANUARY 6 TO FEBRUARY 14 Two couples meet at a fertility clinic under extenuating circumstances in the world premiere of Within the Glass, which calls into question each of their desires to become a parent. JANUARY 7 TO 10 Fans of the film Avatar won’t want to miss Cirque du Soleil’s latest touring show, Toruk: The First Flight. Inspired by the Academy Award–winning movie, Toruk delves into the backstory of the Na’vi culture, with large-scale puppets representing a slew of Pandoran animals like the Viperwolf, Direhorse and Turtapede. A narrator guides audiences through the story—set thousands of years before the events of the movie—as three young protagonists embark on a new quest. OCTOBER 1 TO 4 Nesters seeking inspiration for their abodes can find it at the Toronto Fall Home Show. The biggest public event of its kind in the city presents tips and trends from television personalities like Bryan and Sarah Baeumler, as well as Cityline expert Leigh-Ann Allaire Perrault, decorator Michael Penney and renovator Michael Upshall. Find small-space ideas and solutions as well as eco-friendly products, and shop for new items from more than 300 retailers. SEPTEMBER 1 TO 27 Some shows defy categorization. Such is the case with Empire, a travelling production that comes with its own theatre, a mammoth, 700-seat tent with upholstered booths, beveled mirrors and a speakeasy style bar. Part circus, part cabaret and part burlesque—parents be forewarned, some exposed skin and scantily clad performers are featured—the provocative, daring, seductive and graceful performance includes the likes of a Japanese wheelmaster named the Half Naked Asian Dude Wearing Pigtails, a contortionist trapped in an aerial sphere and gymnasts who form pyramids with their bodies. Parapan Am Games: Panamania Brings in Janelle Monae, Tanya Tagaq and More! THE TORONTO 2015 PARAPAN AM GAMES HAVE BROUGHT MORE THAN JUST SKILLED ATHLETES TO THE CITY. BIG-NAME MUSICIANS AND ARTISTS ARE IN TOWN FOR PANAMANIA FESTIVITIES, TOO! AUGUST 7 TO 12 As more than 1,600 para-athletes demonstrate the amazing strength, resilience and grace of the human body through the 15 sports of the Parapan Am Games, a slate of performances and exhibitions adds a cultural component to the festivities. In conjunction with July’s Pan Am Games and this month’s Parapan Am competition, Panamania continues to feature daily free concerts plus nightly victory celebrations and fireworks at Nathan Phillips Square (100 Queen St. W.). AUGUST 1 & 2 Outspoken funnyman and film star Kevin Hart is slated to perform three stand-up sets over two nights at the Air Canada Centre. AUGUST 2 & 3 Toronto-born hip-hop star Drake’s OVO Fest returns to the Molson Canadian Amphitheatre for another year. J. Cole is the announced special guest, but if history is any indication, there will no doubt be many other surprise appearances. AUGUST 4 The Molson Amphitheatre presents a double-bill of 1990s rock heroes: The Smashing Pumpkins (well, Billy Corgan plus three other non-original band members) riff on their latest record, while Marilyn Manson promotes the new tunes of his The Pale Emperor album. AUGUST 6 TO 16 What began in 1991 as a means for five friends to help smaller theatre companies mount their works is now a bona fide success story as the SummerWorks Performance Festival marks its 25th anniversary. Although the festival’s initial productions were chosen via lottery, today it’s the largest juried event of its kind in Canada, presenting works in four disciplines: theatre, dance, music and live art, plus a series of special showcases. The silver anniversary lineup includes MacArthur Park Suite: A Disco Ballet, a fusion dance hybrid set to music by Donna Summer; an interactive performance art experiment titled Speed-Dating for the Senses (and the Sensitive), in which blind-folded participants explore what they find attractive through sound, smell, taste and touch; and An Evening in July, which invites audiences to be the guests at a re-creation of Helene de Rothschild’s 1972 Surrealist Ball, based on the Grey Gardens documentary. ALTHOUGH THE PAN AMERICAN GAMES ARE DEFINITELY THIS MONTH’S BIGGEST EVENT, THERE ARE STILL MANY OTHER THINGS TO DO IN TORONTO. GET OUT AND ENJOY SOME OF THE GREAT PERFORMANCES, FESTIVALS AND MORE TAKING PLACE THROUGHOUT THE CITY IN JULY! JULY 1 TO 12 The spotlight shines on up-and-coming playwrights and independent theatre companies during the annual Toronto Fringe Festival. Founded in 1999 as a means to give writers and a producers a chance to mount new works or test unconventional productions, the annual event now sees more than 1,000 performers taking part in 150-plus shows. This year’s selection includes a study of death in Evan Brown’s A Tournament of Lies, in which a group of friends competes to see who among them is more grief-stricken, while the ambitions of a waitress/wannabe rockstar are the subject of Served by Graham Isador (pictured). See fringetoronto.com for a complete schedule. 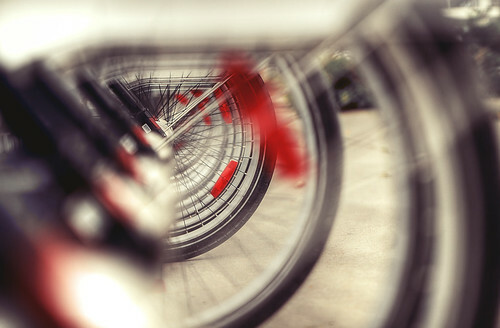 This beautiful image captures Toronto’s bike sharing program in an artistic perspective. The streets are lined with bicyclists enjoying the autumn sun on their daily commute, and images of bikes zipping by are plentiful. What is interesting about this photo is that it captures static bicycles, adding intrigue and new depth to a scene that is easily overlooked. Submit your photo to our Flickr Group and we will consider including it in our Photo Friday series on Where.ca! We’ll credit you and link to your photo.